Brief Synopsis – A elderly Irish woman seeks the help of a journalist to find her lost long son who she gave up for adoption 50 years earlier. My Take on it – This was a very good film. I enjoyed many aspects of it. Director Steven Frears does a nice job juggling all of the contrasting themes here and ultimately gives us a very enjoyable movie. This movie is part mystery, part a story about finding your true self, part a story about faith or lack of it and also finds ways to subtly condemn the Catholics Nuns of Ireland and the Reagan administration for wrongs they may have committed. There are numerous aspects of this story that we would probably see as being impossible if we didn’t know that it is based on true events and that those “coincidences” are documented. This rightfully stands among the 2013 Oscar Best Picture nominees (even though it has no chance of winning). Bottom Line – Very moving story that would be much more unbelievable if we didn’t know it was true. Acting is superb and the message of the movie is clear. Powerful story but still lacks an emotional connect that feels missing along the way. Highly recommended! Definitely a very good film. If just short of excellent. I was quite surprised because I didn’t really know what to expect. Glad you liked it also! I saw it one of its opening weekends, long before the Oscar buzz. So I didn’t know what to expect either. Maybe that worked for both of us. I don’t know. never heard of that. do you recommend it? Yeah its great. Check out my review! wow! will check it out thanks Mikey! 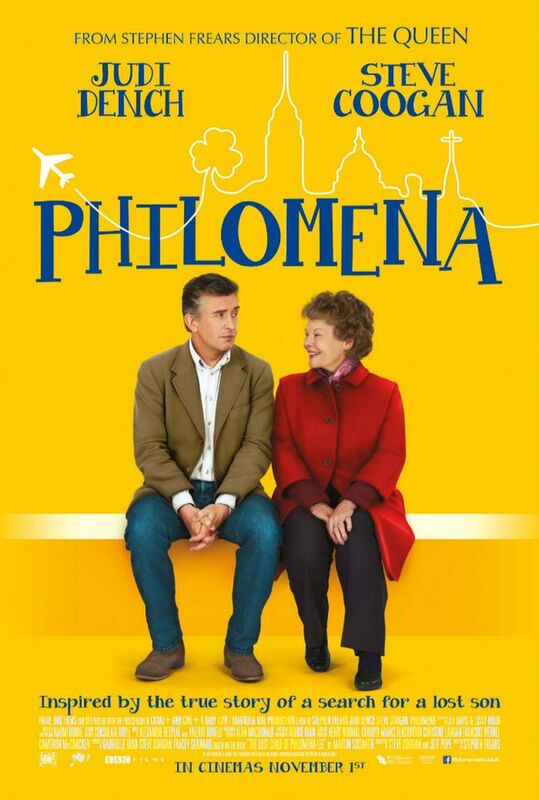 I really liked Philomena. It was so touching and yet, to me, deeply upsetting as I reconciled it with stories I’d heard myself growing up about the laundries here. Awful to think about, but the film itself I thought presented the issues well. Nice review Rob! Thanks for stopping by and commenting V.
Yes. the issue was presented very well. I hadn’t heard about those laundries before, so for me it was quite eye opening. (guess you had to be from Ireland to hear more about it). There are a lot of these kinds of stories, and the further back you go in time, the worse they seem to get. Luckily nobody in my family has a story like that, though there was a woman on my road who was effectively raised in a laundry after having a baby at fourteen and didn’t leave until she was in her forties. Thankfully, things have changed. But the stories of the mistreatment of women and children in this country by the hands of these kinds of institutions remain very fresh in our minds. Somehow I missed this comment, sorry. Sounds like it’s all still fresh wounds and this movie (and the book) really are opening a can of worms to the world about a dark time in your country’s history. Appreciate the info and the always thoughtful comments. Annoyed I missed this one in the cinema & won’t be able to see it until after the Oscars now. Does sound good.